To determine the modulus of elasticity we shall conduct the experiment. The experiment consists of two identical wires suspended from a rigid support. Among the two wires one wire is a reference wire and the 2nd wire is an actual experimental wire. On the reference wire a fixed weight is applied whereas on the experimental wire a variable weight is applied. A is arranged as shown in the diagram. 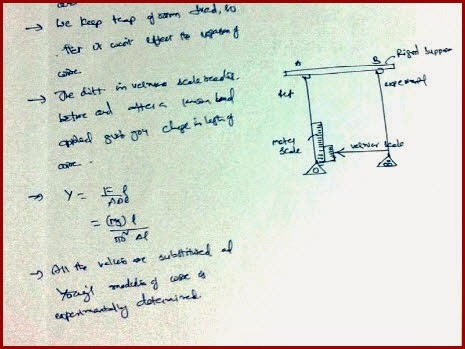 Initially the apparatus is adjusted to a basic reading. When the load is increased , the reading of the vernier calipers changes and basing on its concept we can calculate the increase in its length. Once if you know the increase in the length of the wire exactly calculating Young's modulus is very easy as shown below.